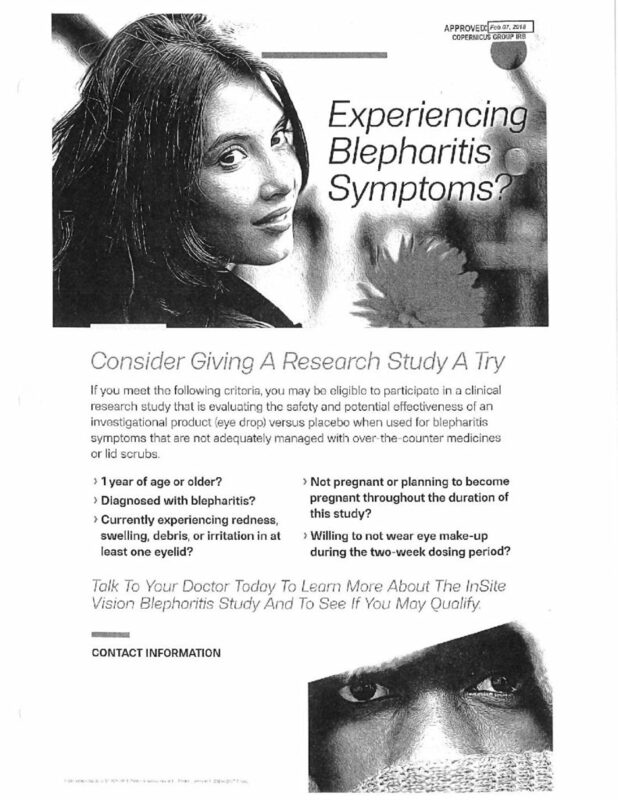 Consider Giving A Blepharitis Research Study A Try! If you meet the following criteria, you may be eligible to participate in a clinical research study that is evaluating the safety and potential effectiveness of an investigational product (eye drop) versus placebo when used for blepharitis symptoms that are not adequately managed with over-the-counter-medications or lid scrubs. 1 year of age or older? Currently experiencing redness, swelling, debris, or irritation in at least one eyelid? Not pregnant or planning to become pregnant during this study? Willing to not wear eye make-up during the two week dosing period?